My brother took these photos for me with his fancy camera. The shutter is so fast it caught the wind playing with my skirt. All afternoon the wind would make it look like I was wearing a crinoline. I am linking up to Posh Frock Friday over at Kate's blog. Do check it out and see what others wore. Oh my gosh, you look fantastic! Love the outfit and your hair looks fab. I love your outfit!! The sweater looks so good with that dress, and I adore your shoes! 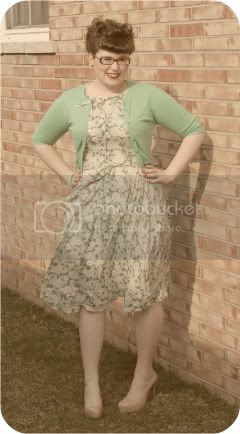 Your hair is ADORABLE (I sadly look horrible in updos) and these are some of the prettiest outfit photos you've taken. I like how swirly the skirt is on your dress. Hello Doll! It's my first time here, visiting from Posh Frock Friday at Scathingly Brilliant. I looooove your dress. You look fabulous. 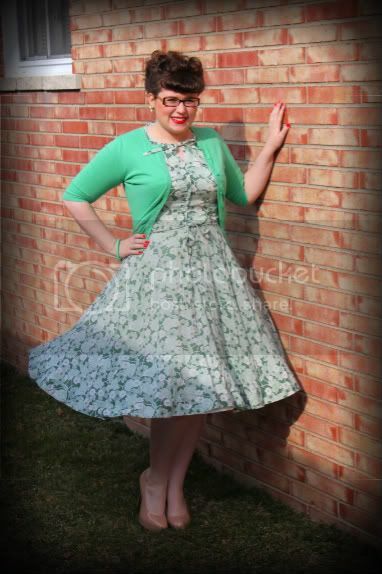 And it sure does look like you have a wonderful crinoline on in that last picture. If I hadn't already seen the first shot you wouldn't have been able to convince me otherwise. Your blog is cute, I signed on as a follower. Now I'm off to check out the rest of it. Indeed a posh frock. It's very spring--love it. You look beautiful Emily. Your hair is brilliant.